Former Secretary of State Hillary Clinton remains the top choice for president nationwide among Democrats and people who lean Democratic, according to a Bloomberg Politics poll released Wednesday, but Vice President Joe Biden and Vermont Sen. Bernie Sanders are close behind her. Thirty-three percent of voters threw their support behind Clinton in the poll, while Biden, who has not decided whether he'll launch a bid, earned 25 percent support. Sanders, who's emerged as Clinton's strongest progressive rival, clocked in at 24 percent. What happens if Joe Biden does run for president? Clinton was once the dominant favorite for the nomination, but the controversy over her use of a private email server and her eroding favorability ratings have led some Democrats to look about for an alternative. 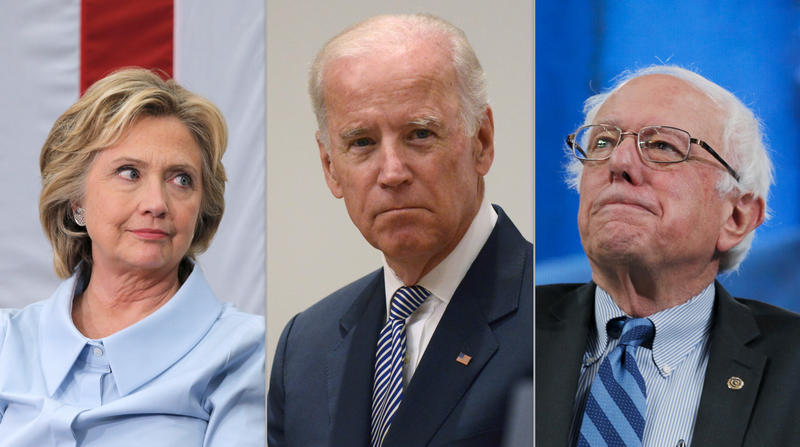 Clinton's favorability rating has dropped from 48 percent to 38 percent since April, according to Bloomberg, while Biden's has risen from 46 to 49 percent during the same period. The vice president, who lost his son Beau to brain cancer earlier this year, has said he's not sure he's emotionally ready for another campaign. But he and his political advisers have been sounding out donors and prominent Democrats to ensure he has adequate resources to run, if he decides to do so. Forty-seven percent of Democrats told Bloomberg they'd like to see Biden join the race, while 37 percent said he should stay out. Fifteen percent weren't sure. While the Bloomberg poll reflects a competitive three-way race, it should be noted that most other recent public polls have found Clinton with a bigger lead. A CBS News/New York Times survey released earlier this month, for example, put Clinton at 47 percent, Sanders at 27 percent, and Biden at 15 percent. Bloomberg's poll surveyed 1,001 adults, including 375 Democrats and people who lean Democratic, between September 18 and 21. The margin of error for results compiled from the full sample is 3.1 percent, and the margin of error for Democratic primary results is 5.1 percent.